We set B2B sales meetings for your sales force with the prospects they want to meet. You need a healthy sales pipeline to grow. Our programs are the fastest and most direct investment you can make to increase your opportunity funnel. ProSales Connection brings together the people, methodology, and experience to deliver highly effective and lucrative sales appointment-setting and inside sales programs for our business to business clients with technical or complex solutions, while providing field sales solutions and support. We offer a turn-key solution that is customized and integrated to meet our client’s unique goals and objectives. Using advanced technology, and carefully developed processes, we provide professional sales development teams in a cost effective, timely and highly scalable manner. Our programs are designed to be a virtual extension of our clients' businesses. This integrated approach yields consistent and measurable results for our clients. We bring talent, discipline, process, experience and leadership to every client program. 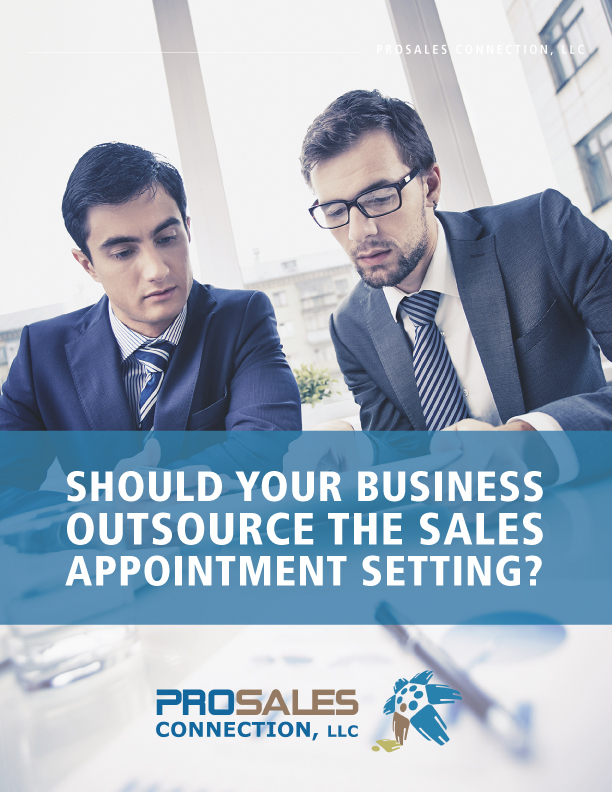 Learn if a sales appointment setting program will work for your business. Increase the productivity of your seasoned sales team by investing in confirmed sales meetings with qualified new business prospects.